Yesterday, I looked at how Evermore yarn would work up in the Snowy Arm Warmers, that really called for a different yarn. In order to further test Evermore yarn out, I knit one of my favorite patterns; a 1×1 ribbed scarf. I started knitting this pattern when I was a beginner knitter because I love reversible knits. With something like a sweater, no one is going to see the wrong side, but scarves are very reversible. I’m the kind of person who would walk around trying not to disturb my scarf so the wrong side flips out. Needless to say, reversible garments feed my OCD. The reversible scarf in all its glory! This is the simplest pattern to do, and it really helps you get a handle on what the yarn feels like. When I first picked up Evermore and my needles, I misread the suggested needle size. I thought it was US 8 instead of 8mm. Right out of the gate I wasn’t knitting with the recommended needle size. This turned out to be rather serendipitous because I preferred to knit Evermore with a smaller gauge needle. The larger gauge felt a little too airy for my liking, but that could very well be a design aspect you’re looking for! Don’t take my word as law, if you’re looking to knit a garment with more ventilation, a larger needle size will be more useful to you. I did knit swatches with the recommended size and the smaller size I was using. It’s always interesting to see how the yarn looks using different gauges. When placed side by side as in the photo below, you can pick and choose the one you prefer. 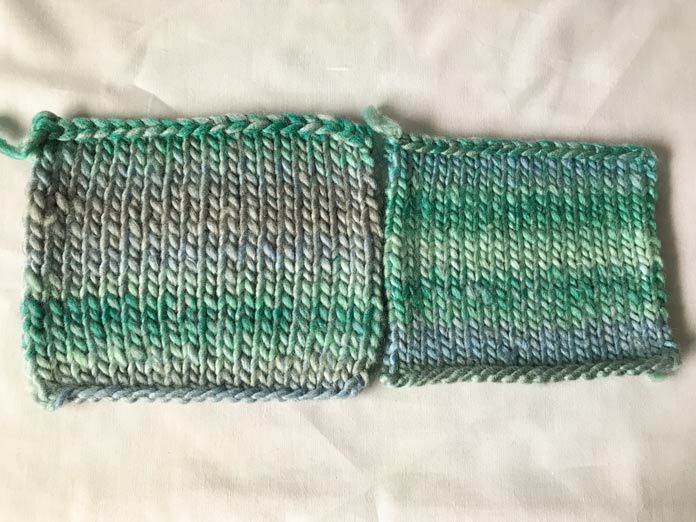 My two gauge swatches, the one on the left is made with the recommended needle size US 11 and the one on the right is made with US 8. Both swatches are made with 20 stitches cast on. Another aspect of Evermore that was portrayed beautifully in this scarf pattern was the striping I tried to achieve. I knit two rows of ribbing, then switched the color and carried the yarn up the side of the scarf. I used two different colors of Evermore that had similar tones in them. The color patterns within each skein of yarn were so busy it made this scarf very colorful. It’s rather difficult to see where the stripes are. Keep this in mind if you’re thinking about knitting a specific pattern. 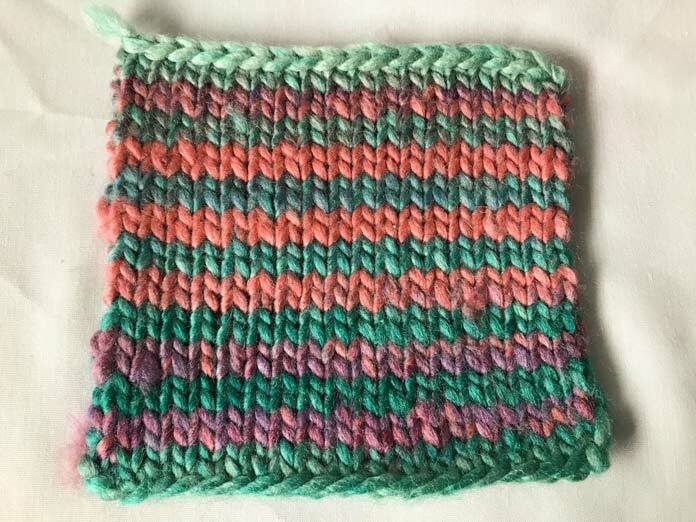 I usually knit this pattern with a solid and a variegated yarn that complement each other, but I have seen it done with two variegated yarns before and it turned out okay. The color repeats were shorter than I anticipated so it made the overall color effect a little more like a Jackson Pollock painting. This scarf is an excellent display piece though. I know there are quite a few visual learners out there who need to see things in order for the concept to really click in their minds. When I talk about choosing the right pattern and the right yarn this is what I am taking about. 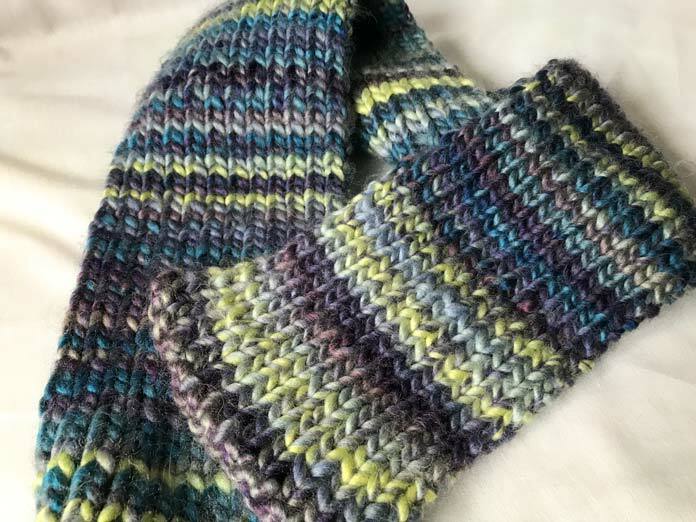 This scarf and the difference between it and the swatches pictured above are excellent visual examples of the different ways you can pair yarns and what an impact it makes on your finished product! 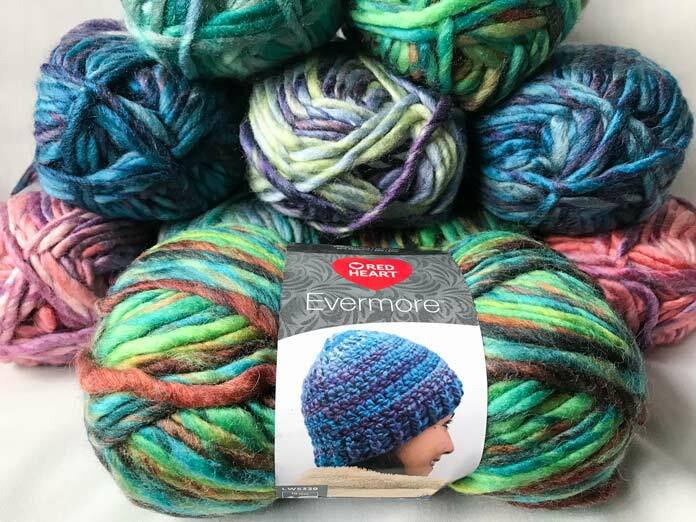 Evermore yarn in a variety of colors. This is part 3 of 3 in this series.